A great FREE event for all Streathamites, Kite fans and those who want a fun day out from further afield. It has everything…music, food…and kites! Volunteers will be needed so if you want to join in – please let us know. We can only make it happen with the community being a part of it. its good fun and you get to be part of a really important Streatham Event. Lex and Irma are the Flying Fish – they started out on their local common in Southampton and in July they were crowned UK National Champions, in dual-line pairs, after four years finishing as the runners-up. Twisted Bridle is Pea and Lisa – a newly formed kite flying pair who are being mentored by the Flying Fish. We look forward to welcoming for the first time to Kite Day. We expect to be hypnotised again by the father and son kite flyers Team SPECTRUM, who have flown together for over 20 years. Members of the Kent Kite Flyers, which has been going since the early 1990s, will be attending the festival. 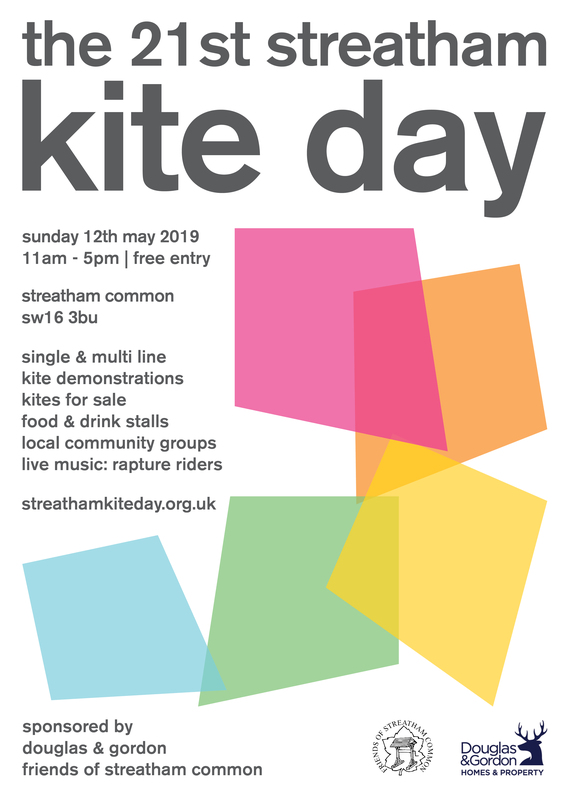 One of the club’s main aims is to spread the word about kite flying and encourage people to get involved so come along and have a chat with them if you need advice or have any questions. The most established club attending Kite Day is the Brighton Kite Flyers – they have been around since the 1970s and have an international membership. Keith aka NASAman will join us again to attempt to use the power of the wind to lift him up into the sky but not quite into space. His incredible kites can genuinely lift him into the air so he often has to be tethered down, just in case. We are pleased to also welcome back the Grumpy Old Gits [GOGs] and their big kites. They are a small, very select club, group or gang of “Old Gits” who make kites, fly kites and muck about. Look out for them as they aim to impress. We are planning to make this event as green as possible. We have food vans on the day selling a fantastic range of food. But if bringing you own picnic, leave zero trace. Please expect to take every bit of packaging back with you to recycle. The park will have litter pickers on the day – BUT WE DO NOT HAVE THE FACILITIES TO RECYCLE. By Bus – 50, 60, 109, 249, 250, 255. By Train – Streatham or Streatham Common stations. By Bike – A23 Streatham High Road – ample space for cycle parking around the common. By Car – Not recommended. Parking restrictions will be in place and the area is already densely populated. Lets help the environment and travel by public transport instead. Do your bit for greening our City. Not sure who looks after the Kite Day website but the link from Google took me to a LARP landing page. They may have been hacked. I’m not sure who to contact about this. Hope you can help.